Strong headwinds and unseasonal rain couldn’t dampen the enthusiasm of participants in the 2016 Ride to Conquer Cancer as they left Perth for the two-day, 200km cycling event through Western Australia’s south west to raise vital funds for cancer research. Tracking a route from the Perth CBD south then west for 100km to the coastal city of Mandurah, 900 riders camped the night and shared inspirational stories of fighting and beating cancer, before rising to clear blue skies and a sunny 100km cycle home. Cameco Australia was proud to once again be represented by a team of five riders in the event. The team, supported by family, friends and colleagues, conquered the 200km and raised $15,000 along the way, which will go towards the work of the Harry Perkins Institute of Medical Research. The Perkins Institute is WA’s premier adult medical research institute, on a mission to improve the health of Western Australians through cutting edge research that translates into new ways to prevent and treat disease. Since 2012, the Ride to Conquer Cancer has raised over $23.5 million for the Perkins Institute and is the largest cycling fundraiser in WA. 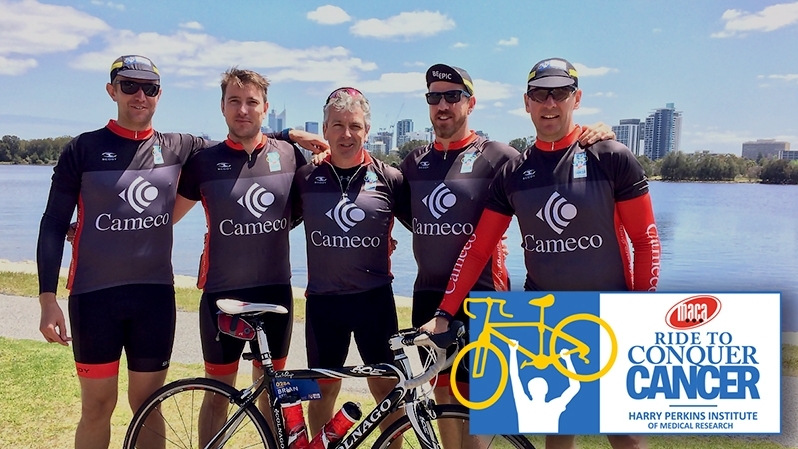 This is the third year that Cameco Australia has participated and we are proud to be part of the Ride and make a positive contribution to the WA community.